This is now at my other blog, Strawberry Mojito at Sidewalk Shoes. I’d love it if you’d start following me there to see new cocktails! Sounds delisch, and awesome photo! It is delish! And thank you! The drink does sound amazing, but even better is that photograph! Wow! Thanks for the invitation, Pam…I just linked up a Ruby Red cocktail. 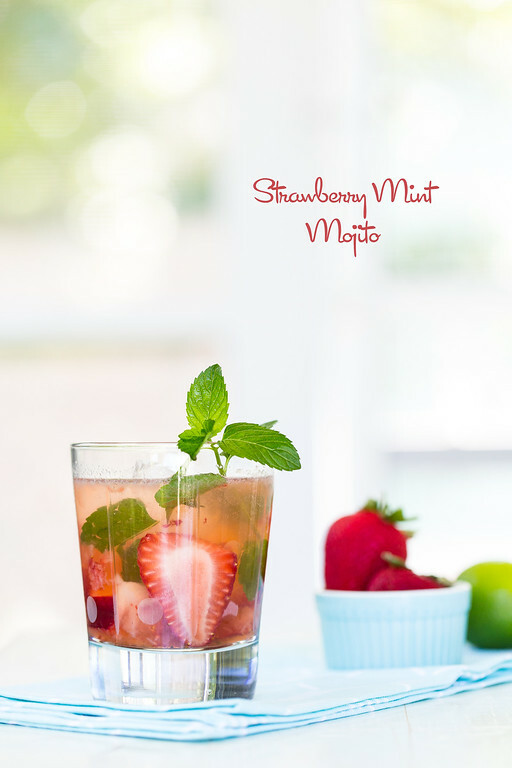 Your strawberry mojito looks amazing!! Mmm this looks yummy!! You know my hubby loves mojitos!! Never heard of this kind of drink before. Thanks for sharing with us a the Home Matters linky party. We hope you join us again! I love Mojitos! We are getting strawberries ripening now in our new strawberry garden and I’ve got some mint in the fridge. Can’t wait to try out this cocktail. Looks perfect! This will be a huge hit for those summer parties! Such a lovely cocktail! Yes please. If it has fruit it works for breakfast, right? I most certainly WILL call these delicious!! I’m a huge mojito fan and make them all the time at home. I have three huge mint plants that go crazy every summer – there’s no better way to use them than in a cocktail, especially this one! I love a good mojito but have never had a strawberry version! This looks great and will be the perfect thing to make with the mint I’m growing in my garden. Hope you have better luck with yours soon! I want to take this mojito and sit by the pool. Actually, I think I will take about 5 of these with me to the pool. It looks so delicious and inviting. I love a mojito and these strawberry mojitos look especially good. Hopefully your mint will rebound so you can have a summer full of mojitos! Great photo Pam! Looks refreshing!